I am writing this from Budapest, the city in which I was born. I went to the United States so young that all my memories of Hungary were acquired later in life or through my family, whose memories bridged both world wars and the Cold War, all with their attendant horrors. My own deepest memory of Hungary comes from my parents' living room in the Bronx. My older sister was married in November 1956. There was an uprising against the Soviets at the same time, and many of our family members were still there. After the wedding, we returned home and saw the early newspapers and reports on television. My parents discovered that some of the heaviest fighting between the revolutionaries and Soviets had taken place on the street where my aunts lived. A joyous marriage, followed by another catastrophe -- the contrast between America and Hungary. That night, my father asked no one in particular, "Does it ever end?" The answer is no, not here. Which is why I am back in Budapest. For me, Hungarian was my native language. Stickball was my culture. For my parents, Hungarian was their culture. Hungary was the place where they were young, and their youth was torn away from them. My family was crushed by the Holocaust in Hungary, but my parents never quite blamed the Hungarians as much as they did the Germans. For them, it was always the Germans who were guilty for unleashing the brutishness in the Hungarians. This kitchen table discussion, an obsessive feature of my home life, was an attempt to measure and allocate evil. Others did it differently. This was my parents' view: Except for the Germans, the vastness of evil could not have existed. I was in no position to debate them. Adm. Miklos Horthy, a regent to a non-existent king and an admiral in the forgotten Austro-Hungarian navy, governed Hungary between 1920 and 1944. Horthy ruled a country that was small and weak. Its population was 9.3 million in 1940. Horthy's goal was to preserve its sovereignty in the face of the rising power of Adolf Hitler and Josef Stalin. Caught between the two -- and by this I mean that both prized Hungary for its strategic position in the Carpathian Basin -- Hungary had few options. Horthy's strategy was to give what he must and as little as he had to in order to retain Hungary's sovereignty. Over time, he had to give more and more as the Germans became more desperate and as the Soviets drew nearer. He did not surrender his room to maneuver; it was taken from him. His experience is one that Hungary's current leadership appears to have studied. Horthy's strategy meant a great deal to the Jews. He was likely no more anti-Semitic than any member of his class had to be. He might not hire a Jew, but he wasn't going to kill one. This was different from the new style of anti-Semitism introduced by Hitler, which required mass murder. A sneer would no longer do. In Poland and in other countries under German sway, the mass killings started early. In Hungary, Horthy's policy kept them at bay. Not perfectly, of course. Thousands were killed early on, and anti-Jewish laws were passed. But thousands are not hundreds of thousands or millions, and in that time and place it was a huge distinction. Hungary did not join Germany's invasion of the Soviet Union until months after it had started, and Jews, including my father and uncles, were organized in labor battalions, where casualties were appalling. But their wives and children remained home, had food and lived. Horthy conceded no more than he had to, but what he had to do he did. Some say it was opportunism, others mere cowardice of chance. Whatever it was, while it lasted, Hungary was not like Poland or even France. The Jews were not handed over to the Germans. Horthy fell from his tightrope on March 19, 1944. Realizing Germany was losing the war, Horthy made peace overtures to the Soviets. They were coming anyway, so he might as well welcome them. Hitler, of course, discovered this and occupied Hungary, which was essential to the defense of Austria. In a complex maneuver involving kidnapping and blackmail -- even kidnapping one of Horthy's sons -- Hitler forced the Hungarian leader to form a new government consisting of Hungary's homegrown Nazis, the Arrow Cross Party. As with Vidkun Quisling in Norway and Philippe Petain in France, Hitler installed his eager puppets. Horthy signed off on this. But that signature, as he pointed out, was meaningless. The Germans were there, they could do as they wanted, and his signature was a meaningless act that spared his sons' lives. My father said he understood him. He had no more power, except saving his sons. Without the power to control events, saving those lives cost nothing and gained something precious. In no way did it change what was going to happen during the next year in Hungary: the murder of more than half a million Jews and a bloodbath throughout the country as Soviet forces advanced and surrounded Budapest and as the Germans fought to their deaths. My parents were grateful to Horthy. For them, without him, the Holocaust would have come to Hungary years earlier. He did not crush the Hungarian Nazis, but he kept them at bay. He did not turn on Hitler, but he kept him at bay. What Horthy did was the dirty work of decency. He made deals with devils to keep the worst things from happening. By March 1944, Horthy could no longer play the game. Hitler had ended it. His choice was between dead sons and the horror of the following year, or living sons and that same horror. From my parents' view, there was nothing more he could do, so he saved his sons. They believed Horthy's critics were unable to comprehend the choices he had. Hungary is in a very different position today, but its circumstances still bear similarities to Horthy's time. The country has a right-wing party, the Jobbik party, which is unofficially anti-Semitic. It earned 20 percent of the vote in the most recent election. Hungary also has a prime minister, Viktor Orban, who is the leader of a right-of-center Fidesz party and is quite popular. There is a question of why anti-Semitism is so strong in Hungary. Right-wing parties, most of which are anti-immigrant and particularly anti-Muslim and anti-Roma, are sweeping Europe. Hungary's far right goes for more traditional hatreds. Orban's enemies argue that he is using Jobbik to strengthen his political position. What Orban is really doing is containing the party; without the policies he is pursuing, Jobbik might simply take power. This is the old argument about Horthy, and in fact, in Hungary there is a raging argument about Horthy's role that is really about Orban. Is Orban, like Horthy, doing the least he can to avoid a worse catastrophe, or is he secretly encouraging Jobbik and hastening disaster? There is little support from Hungary's west, other than mostly hollow warnings. He knows that the Germans will not risk their prosperity to help stabilize the Hungarian economy or its strategic position. Nor does he expect the Americans to arrive suddenly and save the day. So he faces a crisis across his border in Ukraine, which may or may not draw Russian forces back to the Hungarian frontier. He does not want to continue playing the German game in the European Union because he can't. As with many European countries, the social fabric of Hungary is under great tension. The Ukrainian crisis can only be understood in terms of the failure of the European Union. Germany is doing well, but it isn't particularly willing to take risks. The rest of northern Europe has experienced significant unemployment, but it is Mediterranean Europe that has been devastated by unemployment. The European financial crisis has morphed into the European social crisis, and that social crisis has political consequences. Compound this with the re-emergence of a Russian threat to the east, and everyone on Ukraine's border begins asking who is coming to help them. The fragmentation of Europe nationally and socially weakens Europe to the point of irrelevance. This is where the failure of the European Union and the hollowing out of NATO become important. Europe has failed economically. If it also fails militarily, then what does it all matter? Europe is back where it started, and so is Hungary. Orban is a rare political leader in Europe. He is quite popular, but he is in a balancing act. To his left are the Europeanists, who see all his actions as a repudiation of liberal democracy. On the right is a fascist party that won 20 percent in the last election. Between these two forces, Hungary could tear itself apart. It is in precisely this situation that Weimar Germany failed. Caught between left and right, the center was too weak to hold. Orban is trying to do what Horthy did: strengthen his power over the state and the state's power over society. He is attacked from the left for violating the principles of liberal democracy and Europe. He is attacked from the right for remaining a tool of the European Union and the Jews. The left believes he is secretly of the right and his protestations are simply a cover. The right believes he is secretly a Europeanist and that his protestations are simply a cover. Orban knows what Horthy did as well. Hungary, going up against both Germany and Russia, needs to be very subtle. Hungary is already facing Germany's policy toward liberal integration within the European Union, which fundamentally contradicts Hungary's concept of an independent state economy. Hungary is already facing Germany's policies that undermine Hungary's economic and social well-being. Orban's strategy is to create an economy with maximum distance from Europe without breaking with it, and one in which the state exerts its power. This is not what the Germans want to see. Now, Hungary is also facing a Germany that is not in a position to support Hungary against Russia. He is potentially facing a Russia that will return to Hungary's eastern border. He is also faced with a growing domestic right wing and a declining but vocal left. It is much like Horthy's problem. Domestically, he has strong support and powerful institutions. He can exercise power domestically. But Hungary has only 9 million people, and external forces can easily overwhelm it. His room for maneuvering is limited. I think Orban anticipated this as he saw the European Union flounder earlier in the decade. He saw the fragmentation and the rise of bitterness on all sides. He constructed a regime that appalled the left, which thought that without Orban, it would all return to the way it was before, rather than realizing that it might open the door to the further right. He constructed a regime that would limit the right's sense of exclusion without giving it real power. Russia's re-emergence followed from this. Here, Orban has no neat solution. Even if Hungary were to join a Polish-Romanian alliance, he would have no confidence that this could block Russian power. For that to happen, a major power must lend its support. With Germany out of the game, that leaves the United States. But if the United States enters the fray, it will not happen soon, and it will be even later before its role is decisive. Therefore he must be flexible. And the more international flexibility he must show, the more internal pressures there will be. Orban isn't Horthy by any means, but their situations are similar. Hungary is a country of enormous cultivation and fury. It is surrounded by disappointments that can become dangers. Europe is not what it promised it would be. Russia is not what Europeans expected it to be. Within and without the country, the best Orban can do is balance, and those who balance survive but are frequently reviled. What Hungary could be in 2005 is not the Hungary it can be today. Any Hungarian leader who wished to avoid disaster would have to face this. Indeed, Europeans across the continent are facing the fact that the world they expected to live in is gone and what has replaced it, inside and outside of their countries, is different and dangerous. On Friday, India’s Election Commission announced that the Bharatiya Janata Party had swept the five-week election for the Lok Sabha, the lower house of Parliament. The BJP exceeded already high expectations by winning an absolute majority, capturing 282 of 543 seats. With coalition partners, the party will control 337 seats. The Indian National Congress, which has dominated the world’s most populous democracy since independence in 1947, suffered its worst electoral defeat ever. Congress took just 44 seats. Prime Minister Manmohan Singh resigned on Saturday. In the Indian political context, the biggest loser was Rahul Gandhi, who would have replaced Singh had Congress been successful at the polls. His heart obviously wasn’t in continuing his family’s hold on power, however. Gandhi’s campaigning was lackluster and a confirmation of the notion that four generations in any one line of endeavor is at least one too many. His future at the helm of the storied party is in doubt. Gandhi is not the biggest loser overall, however. That honor belongs to Beijing, because it’s certain that in the coming years direct foreign investment will head to India instead of China. For a Chinese economy needing outside cash, the redirection will not come at a worse time. In India, times could not be better for the BJP. Its win was the most decisive since 1984, when Congress’s Rajiv Gandhi won after the assassination of Prime Minister Indira Gandhi, his mother and Rahul’s grandmother. As a result of the landslide, the BJP’s charismatic Narendra Modi formally takes over Wednesday as India’s 14th prime minister. Modi ran on a platform of fundamental economic reform, promising to do for all of India what he accomplished as chief minister of the western state of Gujarat, where with liberal policies he engineered a boom. “He provided Gujarat with India’s first real free-market economy that led to new infrastructure and job creation,” says Subrata Mukherjee, a retired political science professor at Delhi University. As the Wall Street Journal’s Geeta Anand and Gordon Fairclough report, voters like Congress Party subsidies and giveaways but voted for Modi because they wanted India to become one big Gujarat. The breath of the BJP victory, therefore, signals a change in the mentality of a country, a clear rejection of the socialism of its founders. Singh, who just stepped down, gets credit as a leading reformer when he was finance minister in the 1990s and kudos for the boom of his first term as prime minister. His second term as leader, however, was a disappointment. His creaky ruling coalition prevented necessary change, and growth rates tumbled, creating nationwide dissatisfaction. At the same time, foreign investors found themselves hemmed in. Perhaps the most notable example of failed reform in Singh’s last years involved big-box retailing, and Walmart’s highly publicized struggles were a deterrent for multinationals. Many other foreign companies also felt New Delhi’s sting. Yet past disappointment has not soured the outlook about the future. Foreign investors did not wait for the electoral results before pouring cash into the country. The Sensex index has jumped 29.5% since last August, partly because of the expectation of a Modi win. Foreigners bought more than $16 billion in equities and bonds in the past half year and now own more than 22% of the stock listed in Mumbai. Also, the rupee has gained on the dollar recently. This century is already supposed to belong to China, but that pronouncement is not heard as often now. China’s economy, the motor of its rise, is sputtering and on the edge of an historic failure. At the same time, Beijing is intensifying its discriminatory investigations of multinationals. Last week, for instance, authorities accused Mark Reilly, the former head of GlaxoSmithKline’s China unit, of bribery while largely letting domestic corporate malefactors operate unimpeded. In a deteriorating economy, Beijing’s blame-the-outlanders policy may be good politics, but it is very bad economics, especially in the long run. China, unfortunately, is unlearning the wisdom of the Chinese leader who launched reforms at the end of the 1970s, Deng Xiaoping. Manmohan Singh, once called India’s Deng, has now left office in failure. Among his shortcomings, he was not able to open up his economy. At the moment, the environment for foreign companies in China is still way better than that in the subcontinent. Yet it is trend lines that are important for investment flows. In China, things are getting worse for foreigners, and in India they are going to get a whole lot better. A central tenet of Modinomics, as it is now called, is that large businesses create jobs, prosperity, and a better society. Just ask Walmart. Modi ran on a platform affirming existing rules that keep foreign companies out of India’s retail market, a sector in desperate need of modernization, but the plank is largely thought to be a bow to political expediency. In any event, it did not deter the world’s largest retailer from upping its involvement in India. In anticipation of a Modi win, the Bentonville, Arkansas-based behemoth last month announced plans to open 50 new wholesale stores there as well as grow its e-commerce operations. You can be sure that Walmart did not do this with the expectation that it would forever be kept from participating directly in India’s $500 billion consumer market. Analysts point out that Modi is an “old friend” of China, but he may be the worst thing to happen to that country in a long time. At a moment when the Chinese economy is teetering, he is indirectly giving it a shove in the wrong direction. The “giant sucking sound” you will soon hear is money, once headed for China’s shores, on its way to India’s instead. At a momentous time for the world’s largest democracy, we present perspectives on India’s future from the McKinsey Global Institute (MGI) and our recent seriesReimagining India. Our latest thinking, wherever you are. Install the McKinsey Insights app for iPad or Android. New Delhi, May 20 (ANI): There is now a library in a girls' Islamic school in Islamabad that has been named after Osama bin Laden. Elsewhere in Islamabad, a mosque has been named after Mumtaz Qadri, who shot and killed Punjab Governor Salman Taseer three years ago. Taseer's son remains in captivity of terrorists for two years now. Authorities in Khyber Pakhtoon Khwa have removed chapters on Bacha Khan (Khan Abdul Ghaffar Khan) the noted Pakhtoon leader and his poet son, Ghani Khan from the history syllabus in schools. Ghaffar Khan, an associate of Mahatma Gandhi and known as the Frontier Gandhi for his beliefs in non violence and his poet-philosopher son were presumably targets of radical elements. Rashid Rehman Khan, a lawyer and human rights' activist, was shot dead in Multan on May 7 because he supported those accused of blasphemy while the mother of a young polio victim was gunned down by the Taliban in Karachi. One of Pakistan's best known journalists, Hamid Mir survived six bullets pumped into him for daring to talk about missing persons of Balochistan despite being warned against doing this, while another journalist, Raza Rumi escaped an assassination attempt a few weeks ago. Bigotry and intolerance appear triumphant. While there has been considerable commentary in Pakistan about what happened to Hamid Mir, there is silence about the fast unto death by a young Baloch Latif Johar who has been seeking the release of Zahid Baloch, Chairman of the Baloch Students' Organisation, who was abducted from Quetta on March 18, 2014. Johar's statement announcing his fast is evocative. He said "I am a student. Studying, writing, learning, exploring are my hobbies. But all of this has become impossible for me, thanks to Pakistan. My friends disappear and end up dead, dumped on empty street-sides with blood-curdling scars on their bodies. My schools and colleges are turned into cozy military barracks. Uniformed men with guns surround the playground where school kids would circle not so long ago. Libraries closed and librarians 'missing,' they say." .... He adds "This quiet but peaceful struggle will continue till my last breath. I want to make it clear to the world that we strongly believe in a peaceful struggle which is why I am here willing to give up my own life for my nation rather than taking anyone else's." Johar began his hunger strike on April 22 and his health is sinking but there has been no reaction from the authorities. There has bee hardly any coverage in the media barring one recent article in the Friday Times and he is not fasting in some remote part of Balochistan like Turbat or Kech but outside the Press Club. The advisory that Hamid Mir had apparently not followed is being carefully observed by politicians, liberal thinkers and writers and all sections of the mainstream media. They are now more willing to talk about the girls that Boko Haram kidnapped in Nigeria than the Baloch boys that have disappeared, now believed tortured and killed. The world also does not care but there are some expatriate Baloch who have carried out their campaign on the social media and accessible to all those interested in knowing what might be happening in Balochistan. On any given day, there are heartrending stories and only the strong can see some of the photographs of torture and killings of the Baloch. Although Pakistan authorities have fairly succeeded in converting Balochistan into a virtual padded cell, some screams do make their way to the outside world. There are a few exceptions to this global silence. For instance, in the preface to her book, 'The Wrong Enemy' Carlotta Gal says 'In Balochistan, where the Pakistani military was waging a dirty war against Baloch nationalist rebels, disappearances of journalists and political activists were common. Hundreds of Baloch were missing or detained. Many turned up dead. Cases of extra-judicial killings by Pakistani security forces became so frequent from 2006 to 2013 that human rights organisations described the practice as "kill and dump." She goes on to say "The ISI in particular was responsible for picking and threatening local journalists all over the country...... "
The Baloch voice remains muted in Pakistan and Balochistan; the rest of the world is too engrossed in Iran, Syria and Ukraine; the only interest is to vacate Afghanistan and Pakistan must be humoured till that happens and Indians are far too self-engrossed to think of anything else but their own elections. Besides we seem too defensive that talking about human rights abuses in our neighbourhood would tantamount interference. This goes to the extent of not even talking about what is happening to Hindu families in the Punjab Province of Pakistan. Even so, Baloch expatriates, the few that there are in Europe and Canada have been staging protests is Berlin, London and Toronto. In recent days one can discern that the number of protests are spreading inside Pakistan. According to the Human Rights Commission of Pakistan, there have been 292 enforced disappearances from Makran since 2004 that could be confirmed. However, the figure could be as high as 500. As many as 100 were found tortured and dumped, 150 detainees were released while 48 were still missing in April 2014. 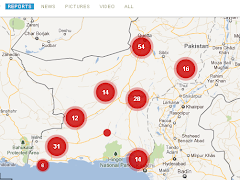 In 2013 as many as 116 bodies were found across Balochistan of which 87 were identified by families who accused Pakistan's security agencies of perpetrating these atrocities. Strong arm methods mostly by the Frontier Corps and the Army to control the insurgency in Balochistan including the killing of innocent Shia Hazaras by Sunni militants of Ahle Sunnat Wal Jamat, a.k.a Lashkar-e-Jhangvi, have added to the sectarian conflicts apart from the Punjabi- Baloch problems. The present phase of insurgency has been gathering momentum after the murder of Akbar Khan Bugti in August 2006. A recent example of this was the bomb-attack on the Rawalpindi-bound train at Sibi in early April killing 17 and injuring 46 others. Explosives had been used, gas cylinders aboard the train aggravated the destruction and three bogies were gutted. Meanwhile, an Army operation, backed by the PAF jets and helicopter gun ships, was launched in the Mashky region of Awaran district in May, killing at least ten Baloch. Pakistani forces abducted persons from Panjgur, Dera Bugti and from the outskirts of Quetta, according to Baloch sources. The Asian Human Rights Commission, citing BBC reports, has also urged that there were military operations in April in different parts of Balochistan and in the aerial attacks, 100 innocent people, including women and children were killed. Despite all these detailed reports about disappearances and killings being available, including the discovery of a mass grave of more than 100 bodies three months ago, there has been very infrequent and scanty coverage in the international press and none in the Indian press. The level of distrust among the Baloch and Pakistan's rulers is so deep and the gulf between them so wide that many Baloch nationalists feel that any effort to bring peace between the Baloch and the Pakistani state must have international guarantors. For that to happen there has to be international interest in the plight of the Baloch. The image that emerges is that of a country whose rulers are becoming increasingly autocratic, whose military systems control the media through ruthless means, whose society is becoming increasingly fundamentalist and Islamic. There are increasing pressures from militant sectarian groups who also function against ethnic minorities. Simultaneously there is a perceptible weakening of the liberal class with nowhere to go and this has been brought out some courageous analysts, and eminent journalists in Pakistan. It may be argued by some that the extremist radical element is only a fringe element but that is not how it looks from the outside when the State is unable to either militarily defeat the radicals who indulge in violence or unable to make peace with them on its terms. AHMEDABAD: A joke being circulated by BJP supporters: 2014 elections have proved one thing — a Gujarati can do anything to get a US visa. A direct reference obviously to the US government's decision to revoke Gujarat chief minister Narendra Modi's visa in March 2005 on the grounds that he violated religious freedom during the post-Godhra riots. UK and rest of the European Union immediately followed suit. Rattled only for a moment by the Western double-standards, Modi wasted no time in looking east, making friends and forging alliances with China, Japan and many other countries, including some Islamic ones, spread across Asia and Africa. Of late, Wikileaks have captured the anxiety of western missions in the build-up to his becoming the prime minister. One leaked cable called him 'Modzilla'. Another quoted a political detractor about his unforgiving nature. Most western governments, which have since warmed up to him, do believe that Modi has been nursing a bruised ego. As prime minister though, while he would be expected to show maturity and not allow the personal slight to over-ride national interests, he would certainly pay back the goodwill shown by countries which hosted graciously. And it does make sense to do business with Modi who is keen on forging an Asian axis with China and Japan. In November 2011, by which time he was already emerging as a front-runner for 2014, China rolled out a red carpet for him. Breaking protocol, a limousine was allowed to go right up to the plane to receive him. Senior members of the Communist Party of China greeted him at the Great Hall of the People, an honour given only to heads of states and governments. Seldom had a state level leader from India got such attention in the dragonland. But this was the culmination of several years of Modi's efforts to build bridges with China and all other countries which welcomed him with open arms. It was Modi's third visit to China after the US visa ban. Japan has been another favourite, especially because of the country's interest in the Delhi-Mumbai Industrial corridor — 40% of which passes through Gujarat. The leadership in Japan, a conservative country when it comes to investments abroad, is impressed with the port-led development in Gujarat and would like to set up huge industrial bases along the corridor.